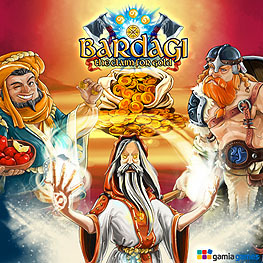 Bardagi - The claim for gold, is a strategy game. The aim of the game is to score more glory points than your rivals. You gain glory with occupied areas, claimed gold mines, building upgrades and the amount of gold owned at the game end. Each player's glory status is always visible on his player board and moved up or down according to game development. Players control four different units that each have their own special ability. How they choose to use their units during the game affects how the game will evolve; be it aggressive, passive or a mixture of both. In the end, your aim is simple: to be the player that gains most glory!